Less chemical applications since the approaches are now zoysia. This will reduce our overall chemical use which is good for the environment. 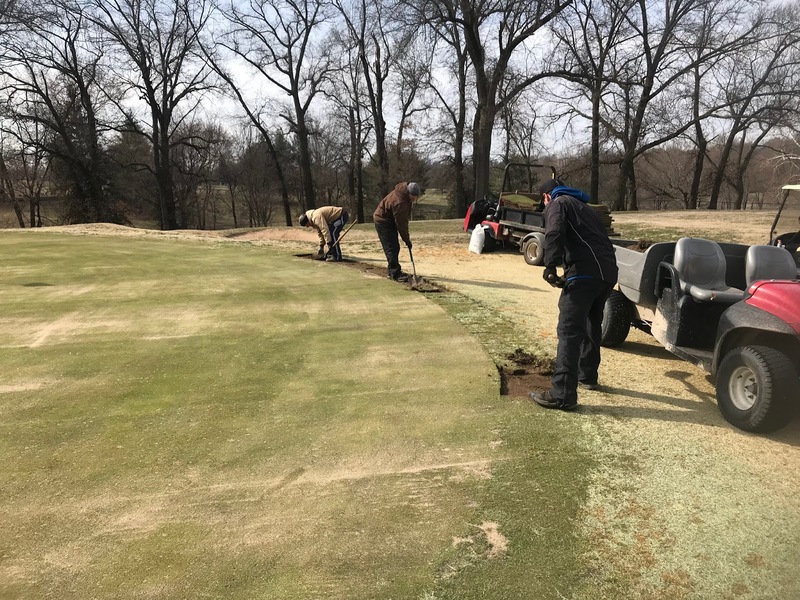 Zoysia requires less water which will make the approaches more firm and allows the ball to release forward onto the green instead of hitting the more heavily watered bent grass approach and stopping. Our collars are mowed with a walk mower which takes more time to mow than the riding mower we can use on the approaches. We have converted them to a single pass mow which reduces labor which can used on other areas of the course. We still have larger approaches on 7, 13, and 15 that will be completed over the next couple of weeks. We reduced the size of 2 and 11 a few years ago but they are still larger than the single lap collars we have converted. We will attempt to remove these if time allows. If we run out of time, they will be worked on this fall. Laying zoysia sod on 10 approach. 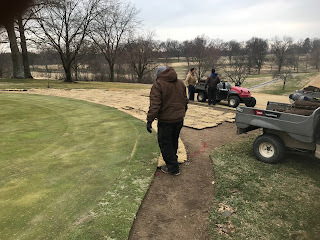 This sod was taken off of 2 tee and used for this new approach. Saved operation a full pallet of sod which costs about $ 300 including delivery costs. It does take extra effort to do it this way with cutting the sod, lifting it and laying it but its great to use turf in another area. 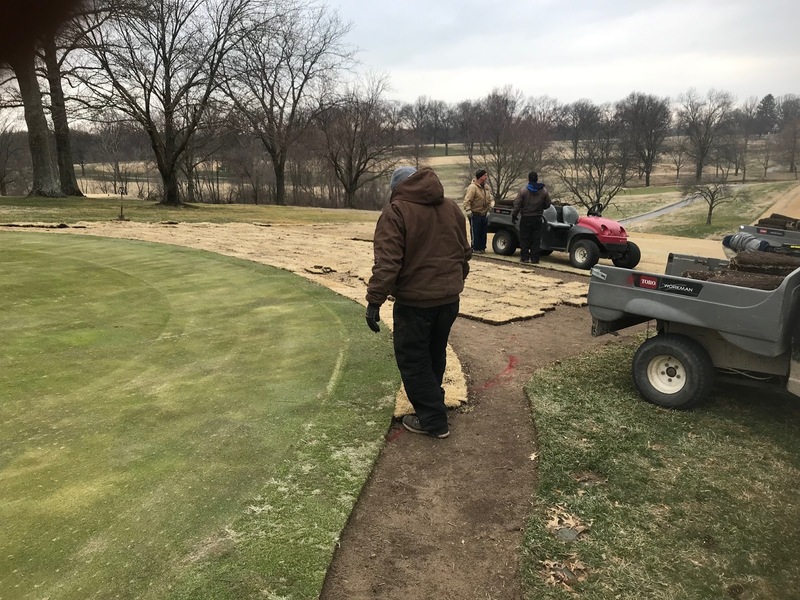 Staff continue to lay more sod on 10. This is a before with the old bent grass being stripped off by the sod cutter.Tom is cutting the bent grass sod into pieces so it could used again on damaged collars. Staff in front of 3 green on the collar removing bermuda infested and thin turf. New bent grass sod in its place. 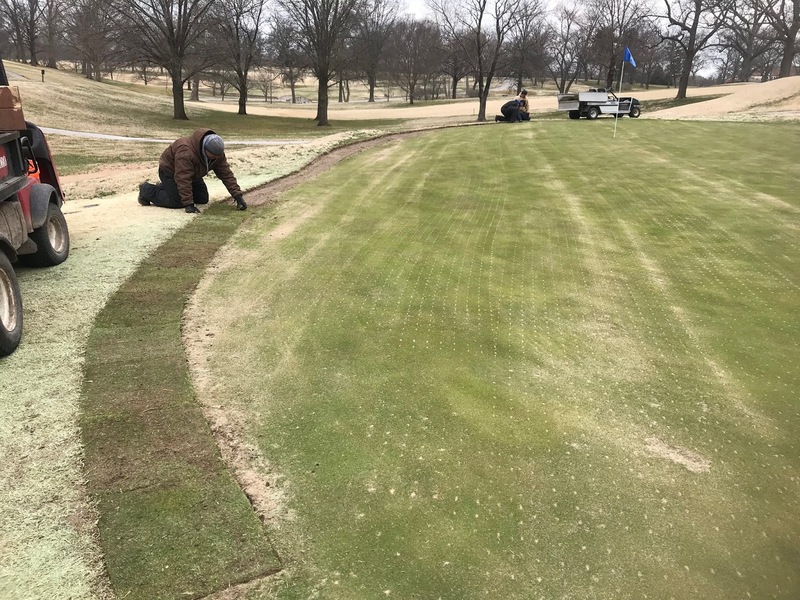 We saved nearly 400 linear feet of bent grass to use on our collars. The guys are finishing up the left side of #6 green collar. This morning the staff began working on our bunkers. Currently they have completed edging and redistributing sand in bunkers on holes 1-8 and the 2 large bunkers on 7. We will attempt to get the rest by early next week. The work has included adding additional sand to each bunker as needed from checking depths. 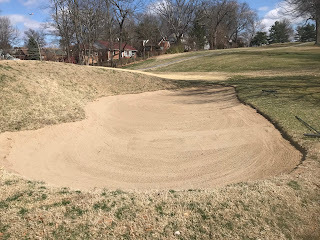 As a player, you should expect that the sand will be a little fluffy in the bunkers that have been worked. 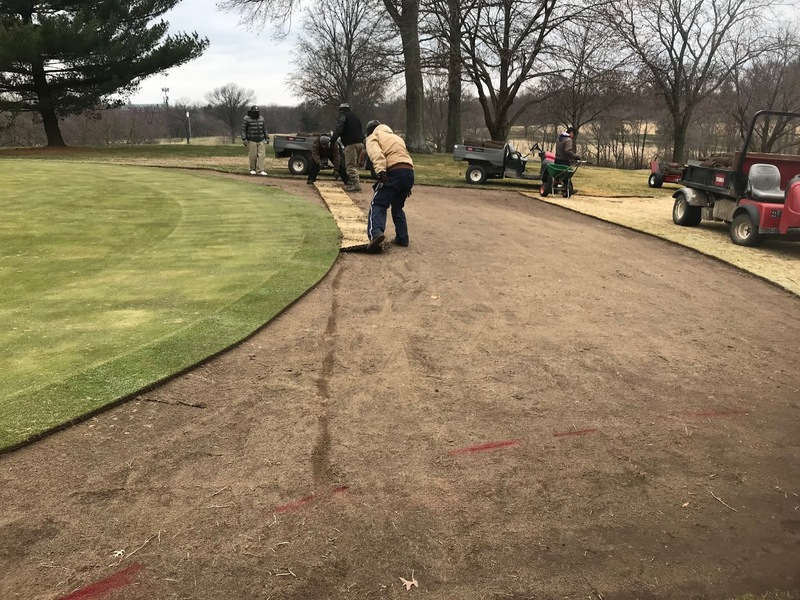 It will take some time for us to get the existing sand to be mixed in with the new sand. We will be taking our packing machine out after heavy rains to help firm up the surfaces over the spring season. No, not a Fox digging holes. These are check holes to see the depth of sand in the bunker to determine if we need to add any sand to the bunker or distribute deep areas of sand to more shallow areas. Bermuda grass the was removed from normally the lower side of each bunker. Over time the bunkers shirk in size due to this fast growing plant. Sand waiting to be added to the bunker on #1. Newly added sand being shoveled and raked on #1.